Some people have very specific reasons for wanting to trace their family back through the years. They may have a family member they’re curious about or an event they want to investigate. It can be to find proof of paternity or trace land ownership or medical conditions. A lot of us though, whether there’s a specific reason or not, also have an innate curiosity about who we are and where we came from. Chances are, your ancestors had to overcome many hardships and you are their future. They may have traveled across the country or from elsewhere in the world. You’re the end product of so many generations that have come before you. 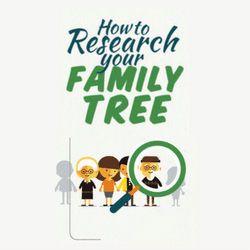 If you’re looking to start researching your family tree, it can be difficult to know where to start. Some paid sites offer easy access to a wealth of information but before you splash the cash, be aware that there are also lots of ways to find out information without paying a fee. We’ve scoured the web to find out the best way to start researching your family tree, so you’ll have the confidence to get going straight away. Grab yourself a cup of tea and our easy to read infographic will guide you through the process. If you’d like to embed this on your site, use the code below. ?</a> by <a href=https://www.craigmanor.co.uk/>Craig Manor</a>.